This is my family's traditional dish for our annual Easter meal. 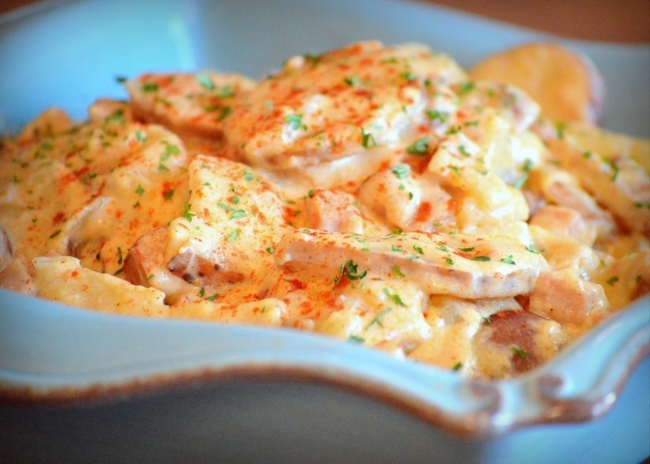 We love the creamy, cheesy, savory taste. We serve it alongside salad and homemade rolls and it is wonderful! Generously coat your Crockpot with non-stick cooking spray. Place a layer of 1/3 of your sliced potatoes on the bottom of the Crockpot. Sprinkle the layer of potatoes with salt and pepper. Next layer on 1/3 of your onions, ham, and cheese. Repeat this process two times. Combine the cream of mushroom soup with the 1 cup of sour cream. Whisk until combined. Spread this over the top of your layers of potatoes, onions, ham, and cheese. Sprinkle the top with paprika and dried parsley if desired. Cook on low for 7-9 hours or on high for 3-4 hours depending on your Crockpot. *With a spatula, carefully combine soup/sour cream mixture into the potatoes and stir until incorporated near the end of cooking. You can also add additional sour cream near the end if it seems too runny. Garnish with additional paprika and parsley when serving if desired.